People often ask me why I became a podiatrist. The answer is very simple. You see, I use to want to be a pediatrician. I saw the word pediatric and by accident I substituted the “e” after the “p” with an “o” and got podiatric. All kidding aside, it is true that I wanted to be a pediatrician since the age of nine. I was a very sick child and I missed 50 days of school in the fifth grade with severe asthma. I knew that going to the pediatrician’s office would make me feel better every time. I liked my doctor and was never scared going to see him. In college, while I was studying pre-med, I decided that I wanted to combine my love of children with sports. I am very passionate about keeping children healthy. I discovered podiatry through my neighbor, and so there you have it, I am a podiatrist. A lot of people don’t know that podiatrists treat children. I see babies, infants and adolescents. Of course, I have numerous patients between the ages of 90-104, (yes 104) and everyone in between. Children come into the practice with warts, ingrown toenails and an array of other foot problems. We see children with foot and ankle fractures, tendon injuries, as well as heel pain. 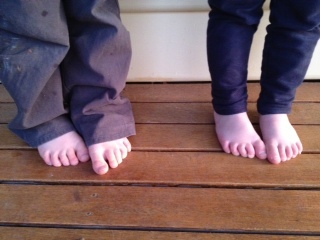 The biggest thing we see with children is severe flat feet. The foot is so severe, the inside ankle bone is almost touching the ground. This causes, or will cause, knee pain, ankle pain, and/or even lower back pain, either now, or when they grow up. Most parents take their child to the pediatrician’s office first and usually get an answer that they will grow out of it. The problem is, that usually after the age of three, they don’t, and I know that because I see them as adults. Most foot problems in children are corrective as well as preventable. If you suspect something wrong with your child’s feet, don’t hesitate, call your local podiatrist. If you live in central NJ, just give Family Foot & Ankle Specialists in Piscataway or Hillsborough a call.